A bill that would set up provisions for growing industrial hemp in the Golden State passed the state Senate Tuesday on a unanimous vote. It now heads to the state Assembly. Hemp bills have passed out of the legislature in 2002, 2006, 2007, 2008, and 2011, only to fall prey to gubernatorial vetoes. Vetoes have come under both Democratic and Republican governors, with Gov. Jerry Brown vetoing the most recent bill because hemp production remains illegal under federal law. The current bill, Senate Bill 566, was written to assuage the concerns Brown expressed in his 2011 veto message. 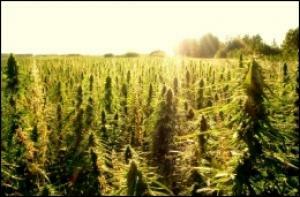 It will not take effect until hemp production is authorized under federal law. "The California Industrial Hemp Farming Act will create new jobs and economic opportunities for many farmers and manufacturers across California," said sponsor Sen. Mark Leno (D-San Francisco). "Hundreds of consumer products containing hemp are made in the Golden State, but the manufacturers of these goods are forced to import hemp seed, oil, and fiber from growers in Canada, Europe, and China. This new bill is carefully crafted to eliminate conflicts with federal law and has the support of the California State Sheriffs' Association." "The prospects for SB 566 are very good. Unlike past industrial hemp bills, this session's version does not go into effect until it is authorized by federal law," said Patrick Goggin, California legal counsel for the industry group Vote Hemp. "We feel confident that California will finally have an industrial hemp law later this year ensuring that California farmers are ready and able to cultivate hemp upon federal approval." Domestic retail sales of hemp food and body care products reached $156 million last year, and the Hemp Industries Association estimates that all hemp products sales, including clothing, auto parts, and building materials, totaled at least $500 million. Companies that use hemp in their products, such as Escondido-based Dr. Bronner's Magic Soaps, currently have to import it because of the federal ban on hemp production. "Dr. Bronner's currently purchases twenty tons of hemp oil each year from Canada. We look forward to the day that we can meet our supply needs from hemp produced right here in our home state," said company president David Bronner. Now, Bronner and other hemp entrepreneurs are one step closer to that day. Why is growing industrial hemp banned in the United States? Isn't it a matter of state sovereignty (rights) to determine appropriate medical, as well as industrial use, of the plant? Hasn't California notified the DEA that marijuana has accepted medical use in the United States, contrary to its classification in the federal Controlled Substances Act? Would not removing marijuana from CSA's Schedule I, as a matter of administrative law, settle these questions? No, as long as it appeared in any schedule of the CSA, growing hemp would be considered mfg. a controlled substance, and require federal licensure for same. It's not a ban, but the security requirements DEA has asked for in the past are said to be prohibitive for something taking up as much space as hemp farming. Practically speaking, it would only allow indoor grows on an experimental scale. The best thing for hemp growers to do would be to apply to DEA to have their hemp strains classified as exempt preparations because of their low THC content. There'd be a lot of paperwork and presentation of research results showing hemp to have a much lower potential for abuse than marijuana. Lot of consultant fees, probably. Maybe first have to get an experimental license for that indoor small scale grow to produce a pilot batch, and then show by experiment that volunteers can't get high smoking it. 4th Annual Hemp History Week Begins! Every day more and more Americans discover the benefits of hemp. This ever-expanding market includes healthy food and body care products, as well as eco-friendly textiles, clothing, auto parts, and building materials. But despite hemp's growing popularity, outdated and misguided Federal policy prevents U.S. farmers from growing this versatile and eco-friendly crop. It is past time for the recommercialization of industrial hemp for American consumers and farmers. As more and more Americans embrace the health and environmental benefits of hemp products, hemp farming and processing promises economic opportunity for farmers and manufacturers. Now in its fourth year, Hemp History Week is a nation-wide education campaign and marketing program that seeks to renew strong support for hemp farming in the U.S. while raising awareness about the benefits of hemp products. The 4th Annual campaign will include grass-roots events across the country, nationwide retail promotions, a day of action, and a national restaurant program. The film covers the history of hemp and its myriad industrial applications as well as efforts to recommercialize it in the US. Bringing It Home explores in part why a crop with so many widespread benefits cannot be farmed in the U.S. today, and examines how hemp is grown in other countries to make thousands of eco-friendly products. Check out the trailer and visit bringingithomemovie.com, to find a local screening in your community this Hemp History Week. For friends of ours in San Diego, we hope you'll join us and the directors of Bringing It Home at Stone Brewing World Bistro and Gardens - Escondido on June 5 at 7pm . You'll also get a chance to try their new Stone Hoppy Brownie Ale they are brewing especially for Hemp History Week! Check out what is being said about industrial hemp in America and Hemp History Week. Show your support for hemp farming and Hemp History Week by writing a letter to the editor of your local newspaper. * Industrial hemp has been grown in the U.S. since the first European settlers arrived in early 1600's. * The Declaration of Independence was drafted on hemp paper. * George Washington, Thomas Jefferson and John Adams all grew hemp and actively advocated for commercial hemp production. * Hemp was a staple crop of 1800's American agriculture, reflected in town names like "Hempfield" and "Hempstead." * Hemp was handled by the U.S. government like any other agricultural crop. More than 150,000 acres of hemp were cultivated as a part of the USDA's "Hemp for Victory" program during WWII. Today marks the start of the 4th annual Hemp History Week (June 3-9). Dr. Bronner's is proud to be a founding sponsor and we hope you'll join us at one of the 870 events taking place nation-wide this week. In this issue of the All-One News we give you a preview of some of the highlights including a new documentary Bringing It Home that's premiering this week. Bringing It Home explores the ongoing efforts to bring hemp farming back to the US and the extensive eco-friendly uses for the plant. We've been amazed at the outpouring of support for legalizing hemp! Over 10,000 emails and calls have been made to our U.S. Senators in the last week encouraging them to support Sen. Wyden's hemp amendment to the Farm Bill, which we expect will be voted on this week. We have made our voices heard loud and clear in Washington that it's time to bring back hemp farming and end the ridiculous federal prohibition. Key Senate leaders including Sen. Leahy and Sen. McConnell are now advocating for this change in federal law but all Senators need to hear our message. Please call or email your Senators today to urge them to support Sen. Wyden's industrial hemp amendment! Let's not forget the good men in your life who deserve some appreciation this Father's Day. Check out our sale on organic and fair trade shaving gels and bar soaps all month in their honor. Finally, we've also got an update about how you can hook up with Dr. Bronner's Magic Foam Experience this summer and a fabulous new hemptella (yes, hemptella) recipe from my sister-in-law Erin Bronner. * Celebrate America's rich hemp history and educate the public about current hemp markets in the United States. * Advocate for federal policy change to allow US farmers to grow this versatile and profitable crop. * Engage consumers by showcasing the range of hemp products available and the benefits that they provide. The 4th Annual Hemp History Week will take place the week of June 3-9. Please get involved to show your support and celebrate Hemp: Our History, Our Future! Hemp is RIGHT ON THE MONEY!